The Planning and Zoning Commission unanimously approved Thursday a text amendment that aims to help homeowners still reeling from flood damage caused to their homes by Superstorm Sandy. The amendment comprises a package of zoning changes, which includes granting an additional 5 feet of building height to many homeowners seeking to elevate their homes in shoreline areas. With the passage of Text Amendment 656, owners of homes on lots totaling less than one half-acre in 100-year flood zones south of the railroad tracks in Westport will be able to raise their houses up to 31 feet above the properties' average-grade elevation. Home heights on those smaller shoreline properties currently cannot exceed 26 feet. The amendment also loosens a number of other regulations for smaller properties in floodplains south of the railroad tracks that already do not conform to all town zoning regulations and lots that would become non-conforming if houses on those properties were to be lifted. Text Amendment 656, for instance, exempts entry stairs and open porches from building coverage counts and requirements for property-line buffers known as "setbacks." The new 31-foot height allowance is also available to non-conforming lots totaling less than one half-acre and south of the rail lines. Text Amendment 656 also stipulates that new above-ground fuel tanks in 100-year flood zones be installed according to National Fire Protection Association requirements to prevent them breaking loose during future storms. That condition was included in the amendment in response to a fuel-oil spill in the town's Ned Dimes Marina in the wake of Sandy, an incident caused by a number of fuel-oil tanks floating away from homes during the storm. The amendment will affect existing shoreline homes in 100-year flood zones, not homes built in the future in those areas. 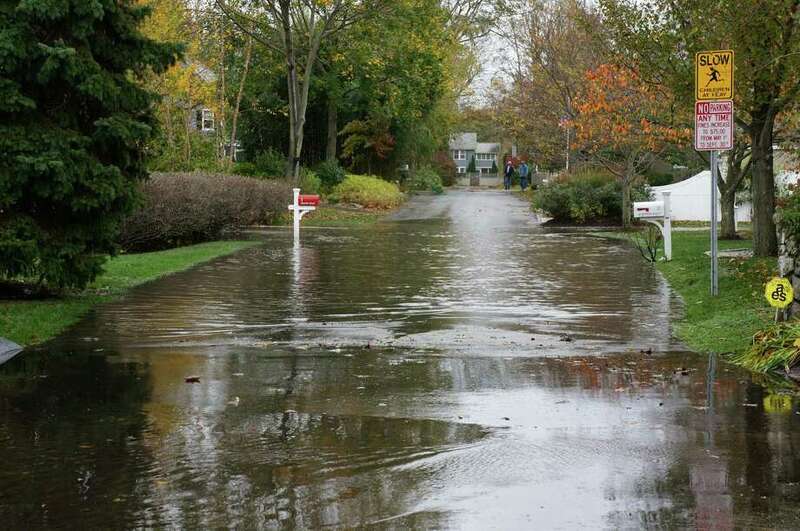 In the aftermath of Sandy hitting Westport, zoning officials have pushed aggressively to implement new zoning regulations to respond to the needs of homeowners in shoreline areas ravaged by flooding during the storm. Less than two weeks after the storm, the P&Z Commission formed a new subcommittee to examine the town's existing zoning regulations for homes within floodplains. The new amendment emerged from several public meetings of that subcommittee. During those public sessions, a number of residents whose homes were battered by Sandy's flood waters urged P&Z members to approve new regulations, which would allow them to raise their homes to Federal Emergency Management Agency standards without having to seek approval from the Zoning Board of Appeals for waivers known as "variances" from the existing zoning regulations. "We didn't want anything here to slow us down to provide the quickest possible relief to those people who are lifting their homes," said P&Z Vice Chairman Jack Whittle. Buildings that were raised above 100-year flood hazard levels or "base-flood elevation" experienced "significantly less damage" during the storm than structures that were not elevated, P&Z Director Larry Bradley said in a Dec. 7 memo to the P&Z Commission. Structures in floodplains that are allowed to be continually rebuilt without being raised above their base-flood elevation become known as "repetitive-loss" properties, according to Bradley. Communities that do not try to eliminate repetitive-loss properties risk continued damage, municipal expenditures and possible increases in flood-insurance premiums, Bradley's memo added. Top Fire Department officials have also been strong advocates for the new floodplain regulations. "I want to thank the commission for taking this up, particularly the subcommittee, for making this an expedited process," Fire Chief Andrew Kingsbury said Thursday. "There are a lot of displaced families out there that we want to get back in their homes." More than 250 homes in Westport were damaged during Sandy, according to town officials. A town study of the properties damaged by Sandy showed an average difference of 3.4 feet between the average-grade elevations and base-flood elevations for those homes, according to Bradley. Using new base-flood elevations proposed by FEMA, which are set to go into effect in 2013, the average difference between the damaged homes' average-grade elevations and base-flood elevations rises to 4.8 feet. By allowing shoreline homeowners another 5 feet of building height, zoning officials intend the new amendment to facilitate the raising of damaged homes to the new base-flood elevations. Only a handful of residents attended Thursday's meeting. One of the attendees, Michael Calise, expressed support for the amendment, but questioned why its provisions did not encompass new construction. "What you are essentially saying by not including new construction is that you can only build a one-story house under the current regs, where you have to raise to above the flood level," he said. "I think it's important that the people who are doing new construction be allowed the same rights as people who are trying to deal with the flooding." Whittle and P&Z Secretary Chip Stephens responded that first implementing an amendment that affected only existing homes constituted an essential and expeditious move to help the large number of shoreline residents' whose homes were flooded during Sandy. "When we were doing the subcommittee, we had people in here who could not afford new construction, they didn't have houses and were not going to be able live in houses for over a year," Stephens said. "Our mission was to get this done, get it out, so people could move back into their houses and we'd address, hopefully, 90 to 95 percent of the properties, so they wouldn't have to go for variances." P&Z members indicated, however, that next year they would consider revisions to zoning regulations for new homes in floodplains. Land-use consultant Gloria Gouveia said she also backed the amendment. But she argued as well that the zoning changes should cover new construction to help owners of the 30 homes in town that will need to be rebuilt because they were damaged so badly by Sandy. Expanding the text amendment to include homes built in the future would require withdrawing the proposal reviewed Thursday and putting forward a new amendment, argued P&Z member Ron Corwin. P&Z members then moved quickly to approve the new floodplain regulations. Text Amendment 656 goes into effect Jan. 4.